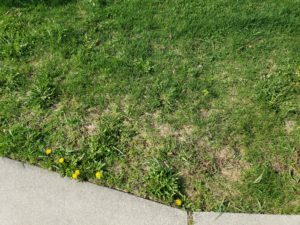 With the passing of winter, you may find yourself with a damaged lawn due to your, your neighbor’s, or the snow truck’s usage of de-icing spray throughout the neighborhood to get the snow to melt faster. People commonly use a de-icing spray after it snows that is usually a mix of water and salt. The salt in the water helps melt the ice by causing a freezing point depression in the water, keeping the water from freezing when sprayed onto the ice, so it can melt it quickly. Keep in mind that not all de-icer sprays are created equal. – Sodium Chloride. which is 98.5% rock salt, is the most commonly used de-icer. It’s widely used because of how cheap it is even though it is highly corrosive to stone and concrete and very harmful to plants. It is not effective in really cold climates since it only begins to work at around 15-20 degrees. On top of this, its runoff can pollute natural waterways. – Calcium Chloride starts working at -25 degrees. It can be in the midrange to expensive when it comes to price. It is safer for plants than rock salt but highly corrosive to stone, metal, concrete, and carpets. When not wearing gloves, it can be a skin irritant. The white pellets it leaves behind can be messy. – Magnesium Chloride starts being effective at 13 degrees. It is somewhat cheap and considered to be safe for pets and temporarily safe for vegetation, but the chlorides do build up in the soil over time. – Potassium Chloride’s working temperature is at 15 degrees. It is usually pretty expensive. Used in fertilizers, it is for the most part safe for plants, but the salt can build up over time. – Lastly, are Acetates such as Sodium Acetate, Potassium Acetate, and Calcium Magnesium Acetate. They contain no chloride, and thus are the safest option for your lawns and other plants, being only as corrosive as regular tap water. They are, however, fairly expensive. They start to work at 5-20 degrees Fahrenheit, and at much lower temperatures when in a blend. With that, your best bet for a de-icer spray is to use some sort of Acetate if you are worried about the state of your lawn and other beloved plants, but there are even more alternatives. Sand. kitty litter, ashes, or sawdust are all some effective and safe for plants alternatives to de-icing spray. Now that you know you have other choices for de-icing after a snowfall, you may be past that point and just need help in reviving your salt damaged lawn. Yellowy-brown, withered leaf blades at the start of the growing season is a sure sign of damage from salt. What you want to do is soak the area thoroughly over a few days span to rinse the salt out of the soil. Using pelleted Gypsum soil conditioner can also help to reverse the damage because it contains calcium and sulfur to counter the effects of salt, which promotes new growth and helps the soil retain moisture. Rake out as much of the dead grass as you can, treat with Gypsum, then add a thin layer of compost and grass seed. Be sure to keep the seeds evenly moist until established. For your damaged shrubs and trees, you will notice a browning or yellowing of the leaves as well. Rinse the plants and soil with water as soon as the snow melts. Spray two inches of water over a two to three hour period, then repeat a few days later to disperse any leftover salt. By reversing salt damage early on, you can help the plants leaf out. As tempting as it can be to just throw some salt onto that ice on your walkway, just look at your beautiful green lawn and choose a more environmentally friendly option to keep it healthy and looking great.